A Warwickshire car dealer and a mechanic have been jailed after admitting fixing mileages and forging MOT documents to trick customers. Car dealer, Connan Alexander Harvey was sentenced to 12 months in prison, with mechanic Amit Mistry jailed for six months imprisonment after being prosecuted by Warwickshire trading standards. The pair had pleaded guilty to fraud at an earlier hearing and were sentenced at Warwick Crown Court on Wednesday. In November 2015 used car dealer, Harvey, 28 of Alex Harvey Specialist Cars, Priors Marston, admitted to clocking and misdescribing cars - and to forging documents in order to conceal his crimes. He also pleaded guilty to failing to act with professional diligence by failing to ensure vehicles were roadworthy before selling them on, and for not doing enough to deal with complaints from unsatisfied customers. A mechanic Amit Mistry, 38 of Timkin Way, Daventry also admitted to fabricating or altering vehicle documents as part of the business. Sentencing the two, Judge Parker, said that used cars sales were subject to the same levels of protection as new vehicles and that by creating false MOT certificates, Harvey had undermined that integrity of the system. Harvey sold used Audi cars from a private address and advertised on used car and auction websites. He was investigated by trading standards following complaints from buyers bating back to 2014. During the court hearing last year, he admitted to arranging for the mileage reading on an Audi TT to be wound back from 101,369 to 72,299 before it was sold. He also admitted selling another model knowing that the mileage was around double what was being claimed. 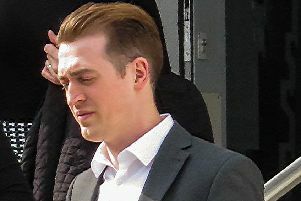 Harvey’s defence lawyer, Mr Brook, said that his client was of good character, had no previous convictions, had shown remorse and pleaded guilty at the first opportunity. Mechanic, Mistry was described as being “genuinely remorseful” for his actions.